I’m loving my Instant Pot! It’s so much more than a regular pressure cooker. It’s a slow cooker, rice cooker, yogurt maker, steamer and more. The question really is what can’t you make in your Instant Pot? I’ve rounded up 25 mouthwatering Instant Pot recipes for you to make and enjoy. Once you get the hang of using your Instant Pot, you may never want to go back to your regular style of cooking! 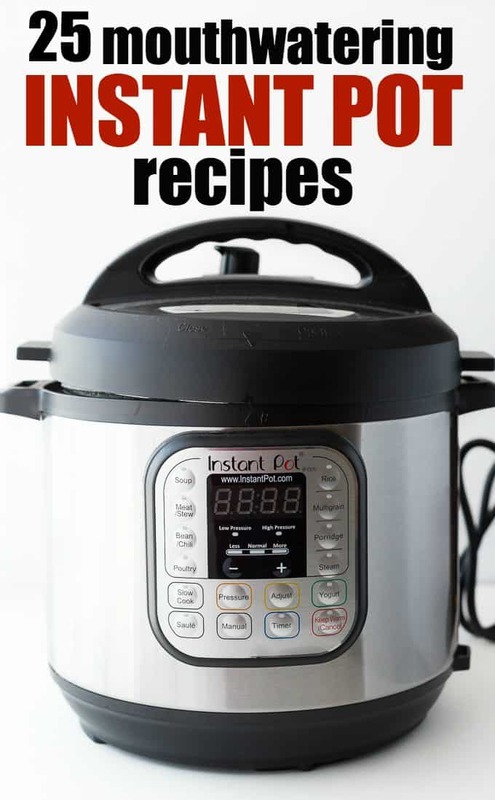 Check out this Instant Pot Guide or Instant Pot gifts. Which Instant Pot recipe will you make first? Hmmm, I may need to look into getting one of these. Seems very versatile! Wow the Instant Pot looks so versatile! I would absolutely love to try the Instant Pot Buffalo Chicken Meatballs recipe! I’m afraid that I don’t have an Instant Pot but I do have 2 pressure cookers 🙂 Still I think an Instant Pot sounds very desirable after reading all these marvellous recipes, it’s such a versatile piece of equipment. I love my Instant Pot, and it’s the only way I make my eggs and potato salad now!! My boss has one of these instant Pots. I’m starting to think I need one and I’m the only one at home! A lot of good recipe’s may have to invest in one of these! The Instant Pot Buffalo Chicken Wings, yum! I have one of these on my want list,have read great reviews about them! 2017 will be the year we add an Instant Pot to our real food kitchen. Thank you for the resources to get started! These all sound amazing. Thanks for sharing my recipes! Yes! I love my instant pot so much… I make a batch of meatball soup every week- so easy in the ip!